Le réalisateur Hajooj Kuka nous immerge dans le monde des fermiers soudanais et des rebelles des régions du Nil Bleu et des Montagnes noubas (Soudan du Sud), qui célèbrent leur héritage et protègent leurs terres face à une campagne de bombardement par le gouvernement de Khartoum (dans le Nord). 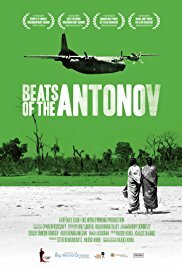 * Winner: Grolsch People’s Choice Documentary Award (This award is presented to the most popular documentary film as voted by audiences throughout the Festival). Kuka has been documenting the farmers, herders, and rebels of the Blue Nile and Nuba Mountain areas since October 2012. For the past two years, they have had to assemble in mountain hideouts and refugee camps to find shelter from air raids waged by the Sudanese government, which targets civilians indiscriminately using Russian-made Antonov cargo planes. After a raid, it is not unusual to hear laughter and music ring out from these communities – not just out of relief that lives have been spared, but also as a means of safeguarding the community’s collective memory. Beats of the Antonov focuses on the everyday survival of people who have lost kin, homes, and livelihoods in the ongoing conflict, but instead of devastation and defeat, we discover communities emboldened to celebrate their heritage, and to improvise creative ways to continue harvesting crops and herding cattle. With inspiring lucidity, Kuka threads together the voices – speaking and singing – of militants, social workers, intellectuals, and other everyday folk, to reverse conventional representations of victimhood and reveal an alternative narrative of tenacity and resilience.